Zebu is a term which is synonymous with "Bos Indicus," the scientific name for the humped cattle of the world. 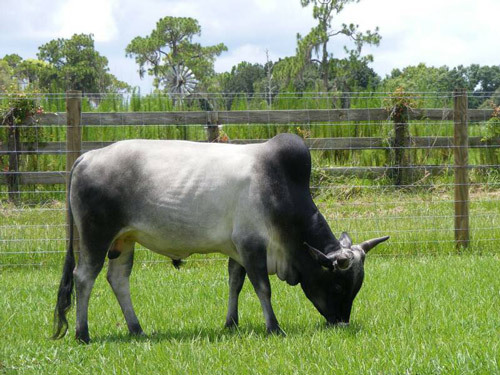 The major Zebu cattle breeds of the world include Gyr, Guzerat, Indu-Brazilian, Nelore, and Brahman. They originated in India, and are thought to be the world's oldest domesticated cattle. They were introduced into the United States as early as 1849. The Zebu Association was formed in the US in 1946. The first importations of Zebu were bullocks for draft purposes, but they later interbred with other cattle breeds and produced hybrids which were bigger, faster growing, and more thrifty. These cattle often did better than the cattle which the colonists had brought from Europe.